The final online spectator system will probably have a 30s delay, that should be enough to keep problems from happening. Maybe there is some way to force dropbox (or some other similar tool) to add a delay as well? If the game itself would delay writing files to disk for maybe 10s ... ? That could be enough already, I'd think. Well, at least there is a delay, even though it's close to real-time. Still, this very well may speed up the process of creating the Spectator Mode I reckon. I think this should be implemented for sure. It took me under 10 seconds to figure out a way to seriously abuse this. Well, of course this can be abused, but wheres the fun and fair play? The main use of this is for me will be to use in our next championship here in Brazil. Oh of course, I'm definitely not saying to remove it. At last, for this time, the "Hu3BR force" gives something really useful to some game community. I post here to give all the coming casters some help to set up the Dropbox syncing so that it works. The Dropbox app is really limited in what it can do, so we'll use another tool to create the directory junction. You can use any tool to do that, I use symlinker because it has a nice GUI. First, rename your original "Replay" folder in the Awesomenauts\Data folder as you want to preserve all your existing replays. Then either create a new folder in your Dropbox or just locate the name of the folder where the replays are going to get synced in the Dropbox itself. For the destination, select the target folder in your Dropbox, e.g. "Stream Replay Team1 vs. Team2"
Select for the type "directory junction"
Then hit "Create Link..." and you're done & ready to go. 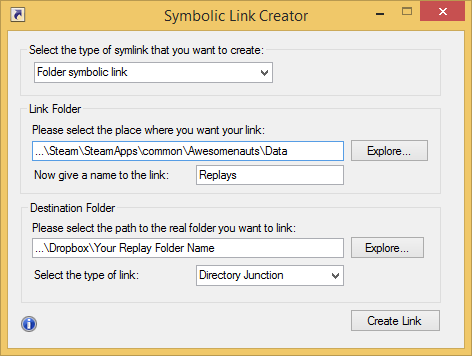 Now, you've got a directory junction (special kind of Windows directory symlink) pointing from Awesomenauts\Data\Replays to the Dropbox folder, meaning that Awesomenauts looks directly into the Dropbox folder. On the right is the Awesomenauts folder. Notice that the Replays folder has some funny little special link icon. 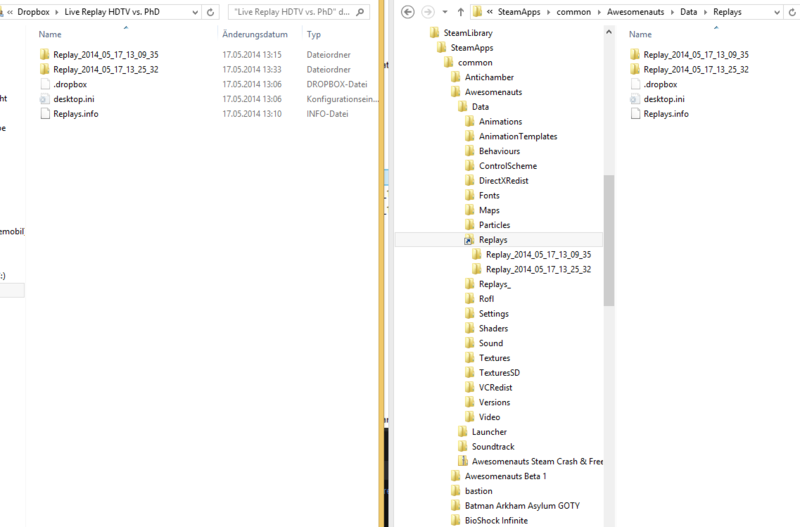 Then, when opening that folder, you get the exact same contents as the target sync folder on the left - in our case "Live Replay HDTV vs. PhD" inside the Dropbox folder. Edit: Maybe I'll do a video or something. However, at least for adsl lines the additional upload will wreak additional havoc to less than stable p2p connections (i.e. all of them), which is about the last thing I need from my opponents to be honest! It's up for the person 'streaming' the match to determine if his internet connection can handle it.